So I came up with this handy solution so you too can be brilliant and ambitious as opposed to stupid and lazy. Write the measurements on a glass bottle. You’ll need to measure your salad dressing recipe into the bottle once. Measure out and add the required amount of vinegar, then mark a line for vinegar. Add the required amount of oil, then mark a line for oil. And on and on. You’ll also need the appropriate pen. It needs to be an oil based paint marker. You can use a Sharpie Oil Based paint marker for instance. Amazon sells them on-line and craft stores and sometime hardware stores carry them. They’re around $5. ATTENTION! The big, fat liar known as the Internet will lead yo to believe you can just use a regular sharpie then bake the bottle in the oven for half an hour to make the Sharpie permanent. This is a big, fat Internet lie. This technique may work on ceramics that have a slightly rougher surface, but it will not work on smooth glass. Won’t. Will not. Then every time you make salad dressing, all you have to do is grab the bottle and fill with the required ingredients to their fill lines. No measuring. No trying to remember what goes in it. The one thing you have to watch out for is the oil. 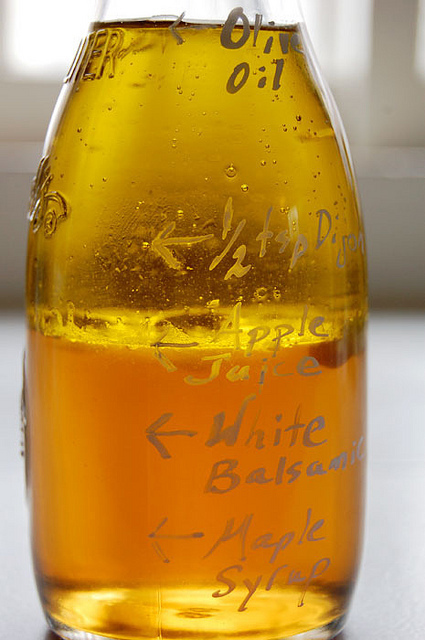 Pour your dressing from the opposite side of the jar that the writing is on. Rubbing with water may not be able to remove the writing, but a drip of oil is dangerous. 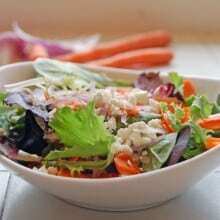 Interested in making the super-delicious salad in the picture above? Here’s my recipe. 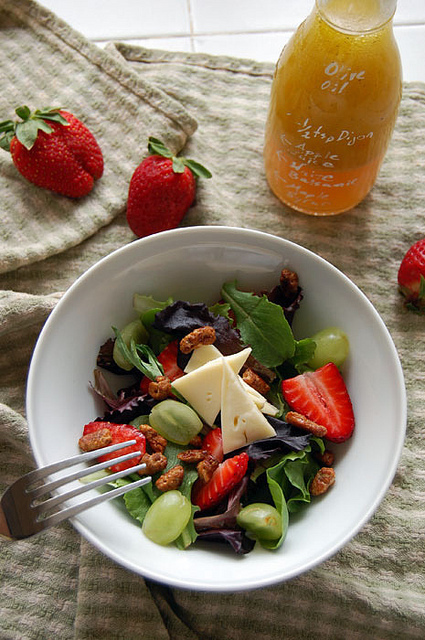 It has spring mix, strawberries, spiced pecans, brie cheese … and is pretty stinkin’ delicious. Hey you. YOU THERE! You’re kindda brilliant and ambitious. Good for you. I’ll be trying your mix as well! We eat lots of salad too! Anyhoo, I completely agree with the Kraft Greek Dressing thing except I also add some Epicure Greek Herbs to my Greek Salad … best. greek. salad. ever & super easy!! You should get into decals. There are some waterslide transfer decals that you can bake on in your oven. In the past I’ve screen printed my own decals using glazes onto waterslide transfer paper, coated the top with clear spray paint and let it dry before applying. After that I would fire them in kiln but you might be able to modify your print medium for a lower temperature for curing in a conventional oven. But it would be highly experimental. 🙂 Feel free to email me if you are interested or want more info. Very wonderful. I would have just called myself forgetful, but . . . your harsher terms “stupid and lazy” fit also. I make my salad dressings only 1/4 of the time for this EXACT reason. Durn it. Why can’t I remember the ingredients? Very clever. Also, I like your salad dressing pourer. Very descriptive, i know. Just wondering. . .is that how you house it in your fridge? Does it have a top, so you get no spills? 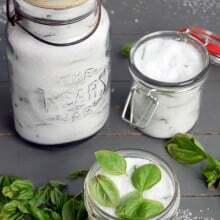 I use mason jars, but they are a booger when pouring. It wouldn’t really be that bad. . .but well you know. . .this is where that stupid and lazy bit comes into play. Nicki – Yup, that’s how I keep the dressing in the fridge. The jar has a metal lid that sticks on it. ~ karen! Now I want a salad for breakfast. Thanks Karen, you make it so easy! Elizabeth – It really doesn’t! It’s actually a really good Greek Dressing. Cross my heart. ~ karen! Perhaps you could write with fingernail polish….? Yup! That’s an idea. Kindda hard, but it could probably somehow be done. ~ karen! Nail polish pen. Or just color coded dots: Yellow for olive oil, red for vinegar, orange for mustard, etc. LOL. If I can’t remember my recipe I definitely won’t be able to remember which colour dot corresponds with which ingredient. Might be able to write with the polish pen tho. ~ karen! I will have to try your recipe. Pinning it! Cheers. 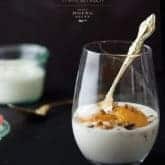 Thanks for what looks like a great recipe. The maple syrup sounds like a great addition! I’ll be stocking up on syrup, as this coming Sunday is Maple Sugar Sunday in Maine…yum. I won’t send you any recipes for Greek dressings, but I will encourage you to put some Greek oregano into your garden. It makes all the difference in making authentic tasting Greek dishes! I agree 95% except my fave is Renees Greek Salad dressing. The rest of the time I make my own and it is usually your amazing maple syrup dressing. Can’t wait until spring so we can get FRESH salad mix! This is a great idea!! Thanks. I am too lazy to make my own dressing. You MUST try Renee’s Greek dressing. You can find it in the refrigerator section in the grocery store. I used to buy the Kraft Greek, but Renee’s has so much more flavor. You will be hooked! This is my fav easy French style salad dressing. I use the tomato sauce instead of soup. I make my own sauce and freeze it during the summer and have plenty. And I seldom used canned goods. But I think when made with tomato sauce it is a really great tasting dressing and easy to whip up. Place all ingredients into a bottle or jar. Thanks Ann. I’ve tried a million different French dressing recipes with no success at all. I’ll copy this to one try. It looks promising. ~ karen! Totally going to do this! Great tip. I am moved by the brilliance of this idea. True story. This is why I love you Karen..I learn how to do things the easy way making me look smart..”Nancy..You are so smart and not lazy”..”Yes..Yes I know that”..HA!..Therefore I get to bask in the glory of your brilliance!! Thanks so much – LOVE the lines idea, I used a similar technique in my restaurant in Ajijic (just closed thank God don’t ever open a restaurant if you love to cook…), with giant service-size containers and yet never ONCE considered doing it for the stuff I make at home. Sheesh! Stupid. Lazy. Slaaaaaazy. If you have ever accidentally smudged WHITE OUT on your clothing and then attempted to remove it know that it is indelible; White Out could be an alternative for line measurements. Can you still buy white out pens? I used to love those back in the day, when I’d write boys’ names on my binders with them.. oh la la. Then they banned white out. Seems like a lot of maple syrup in there Karen – still, I trust you, I’ll try it. I’m also trying Annie’s dressing as I am in a dressing rut, I have been making my mother’s since the Ark. I usually make it in either the oil or the vinegar bottle, and keep it hidden away. I couldn’t buy the pre-marked special bottles as I feel they are bossing me about. If I marked my own bottle I’d feel that I was bossing myself! It’s definitely a sweet dressing. I sometimes kick up the vinegar if I feel it needs more acidity. ~ karen! That looks like an awesome recipe. I’ll try this one too! I’m going to make your salad dressing for tonight’s supper. My balsamic is from Italy and it’s dark so the finished dressing won’t look quite as nice as yours. Thanks for the idea. Wish I had some fresh strawberries and spring mix too. Hi Jeannie B – You can try it but white balsamic and regular balsamic do taste quite different. It’ll probably be fine tho. ~ karen! Awesome idea. My husband makes fabulous dressings all the time and has bits of paper floating around my cupboards with his recipes. I like this idea much better. I made a quick and easy dressing last night that was pretty darn tasty too, but I did it right in the bowl. Pressed garlic clove (toss), Olive oils just poured on (toss), champagne vinaigrette (toss), sea salt, ground pepper, dill, freshly diced rosemary (just a touch) and toss again. Also used spring mix with red onions. Was delicious and light. Jennifer. 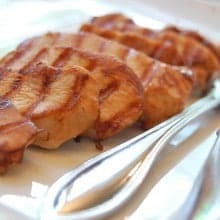 At the bottom of the post I give you the link to the recipe. ~ karen! Ha! Yes it is. I’m no longer when I make a salad dressing but apparently I need to improve my lazy reading skills! I’m off now to find a suitable bottle….. Thanks Karen! That is a bloody brilliant idea. And that salad looks amazing. Excellent idea. I wonder if it could be etched, then it could go in the dishwasher and oil wouldn’t bother it. So far, I’ve been disappointed by every recipe that’s thrown at me as too oily or too sharp, or too bland. Directions like season to taste are useless. And honestly, yours looks kind of bland. Of course, I also prefer creamy dressings and they are a lot of work. They’re also a lot of fat, and I don’t eat salad to up my fat intake. LOL. You sound like you’re in a bit of a growly mood today Amy. I can assure you that just because my dressing is light coloured in no way means it’s bland. Not even close to bland. Yeah, salad dressings aren’t diet food, but I don’t eat them as such. Also, you have to remember you’re not drinking the bottle. You’re just using a couple of tablespoons. That’s all you need for a serving, especially if they’re full of flavour. ~ karen! I don’t know what that is, explain it to me. You’re being put on forced lay off? ~ karen! I’ve got 8 of these little glass bottles (so you know what dressing I’ve been eating, Karen). So trying this, because I am forever losing my dressing recipes. You can buy bottles with ingredient amount fill lines already printed on them. Amazon sells one called Kolder Salad Dressing Bottle. I think William Sonoma carries them as well. They usually have a number of dressing recipes printed on them – French, Italian, etc… It’s a great present to give when you go to visit someone. Hi Geraldine! Good to know. (I wanted to do it this way because I wanted something that worked for my salad dressing recipes) ~ karen! Ok this dressing is amazing. I made your salad and dressing tonight and took full credit for the whole damn thing. Is there no honor among thieves? Thank you for sharing Karen. Amy in StL: Im worried about you and that’s kinda freaking me out because I don’t even know you. Sending you good vibes. It’s definitely a keeper isn’t it. I take a lot of pride in my food detective work. ~ karen! I LOVE this idea! I’m always loosing and forgetting this recipe. It’s my favorite, and now I’ll never loose it again. Thanks! And I was just referring back to your blog for the recipe. Thanks Karen! How do you store this dressing? Do you just shake it up each time before you use it? 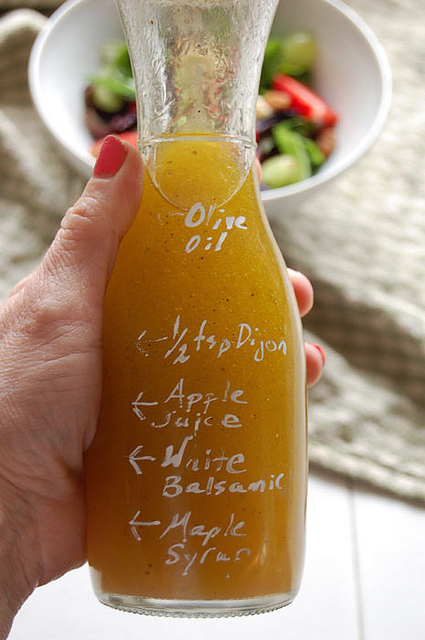 I usually make my own dressing in a single serving every ding dang time we have salad, but this would be MUCH easier! Hi Korinne – Yup, I just store it in the fridge and shake it up before pouring. ~ karen! You cleaver little foodie you! I meant “clever!” HA! not CLEAVER! Although it would be appropriate too I guess! Yup. Works both ways. 🙂 ~ karen! You measure? Am I the only one that just throws the stuff in and shakes it up? Huh. I guess that makes me even lazier than you all. This particular dressing is more involved than most. And when made to exact measurements it’s probably one of the best (sweet) dressings you’ll ever try. Regular balsamic dressings I don’t measure. ~ karen! I always make my own salad dressing, but I’m way too lazy to follow a recipe. Put some vinegar in the tall mixing jar that came with the stick blender, add herbs/seasoning/mustard/shallot/whatever as inspired, a dollop of something sweet (a squeeze of ketsup if you’re out of maple syrup), add oil, maybe a garlic clove. Insert stick blender and push button. Turns out different every time, and always yummy. When it’s super-awesome and will never be duplicated (’cause I didn’t measure or write down what went into it) it’s transcendant. Seems like the kind of thing the Japanese would have a phrase for: the fleeting preciousness of a lone-batch home-made salad dressing. Thanks! I’ll give it a whirl. How about 1) Karen’s pen with 2) clear nail polish over it? Smaaazy! This dressing sounds amazing. I am kicking the bottles out of my cabinet. I have a great time just reading your posts, very clever. What a great tip! It’s just perfect for a single girl like me. It’s so not about spending more time in the kitchen. -I can’t believe I have not thought of this myself!!! Jealous of your brain. -KAREN IS RIGHT PEOPLE!!! Baked sharpie does not stay on!!! I had my 4 year old make personalized mugs for all our family members for xmas, hoping I’d bake it and it would not rub off… LIE! I probably should have asked Karen first. My bad. So yeah, kinda felt like Karen posted this for me. Mark a bottle you idiot!!! This sounds like the best oil and vinegar dressing recipe ever! 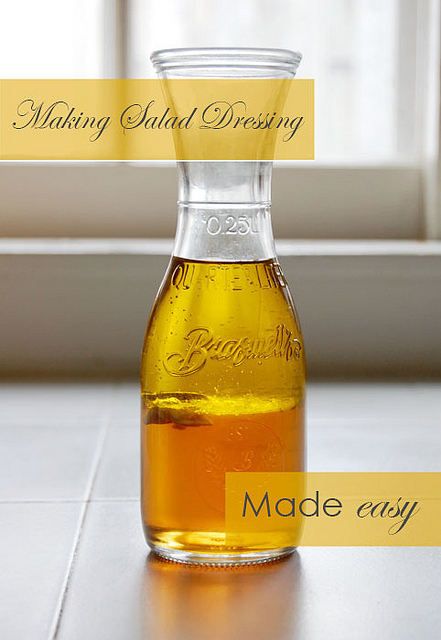 I know I am not going to make any salad dressings cause I am super slazy and I love plain old balsalmic. (Unless there is Ken’s Blue Cheese around.) For those who will, it seems there is always a Good Seasons bottle at GoodWill. BUT, I can’t believe I missed a post!!! Weird. red wine vinegar, olive oil (preferably a super yummy one), 1 clove garlic through a press, salt and pepper. stir, pour. perfection! or add a little dijon for kick. We are stupid and lazy if we don’t make our own dressing? this is not the site for me. I prefer a better quality website.